Yesterday I watched Super Juice Me! an awesome documentary about eight beautiful chronically ill people who transformed their health in 28 days by drinking juice. It was amazing to see how radiant they became throughout the process. I dusted off my juicer and made this after viewing the film. 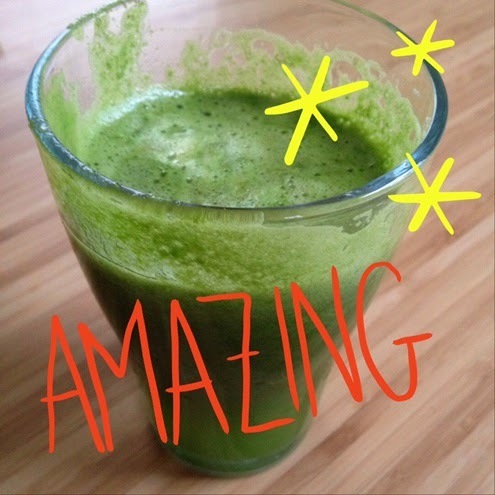 Crisper delight: Romaine, kale, celery, apple, pear, broccoli stem, lemon, and ginger. Super Juice Me! proposes the idea that there is just one disease: inflammation. The chronic illnesses that most Western people suffer from (high cholesterol, diabetes, obesity, etc) are just different manifestations of it. The disease is caused by eating man-made processed foods, toxins (including pharmaceutical medicines), and stress. The journey of these eight people illustrated that the solution to healing this disease is simple: change diet and lifestyle. Cozy up with a kitty (or beloved human), a juice made with one of the recipes you get when you sign up (or whatever you've got in your fridge), and get ready to be inspired by this feature length film! The movie is causing me to reflect on what transformation I'm craving and what little shift I could make in my life to get it. I'm fortunate enough to not be very ill or on any medications. Still, I suffer from lady hormone related issues. I've taken small and medium steps toward changing improving my health. As a result, I've had small to medium improvements. I know in my heart I could kick things up a whole bunch. I thought about how amazing and liberating it'd be to never again suffer from acne, PMS, fatigue, and painful periods that cause me to lose almost a week of my life every month. Seeing the results these eight people had made me realize optimal health, throughout my entire cycle, is possible for me too! I am so inspired to use my sessions with my health coaches (yes, coaches need coaches and yes, I have two!) to address these reproductive issues. I have a tendency to focus on life and business when working with them, but I know getting some outside support and personalized guidance on this health issue would be transformational. You've gotta watch Super Juice Me! soon. Free online screenings run through May 5th at superjuiceme.com. What transformation are you craving? Did you see Super Juice Me? Lemme know what you think of the film too.